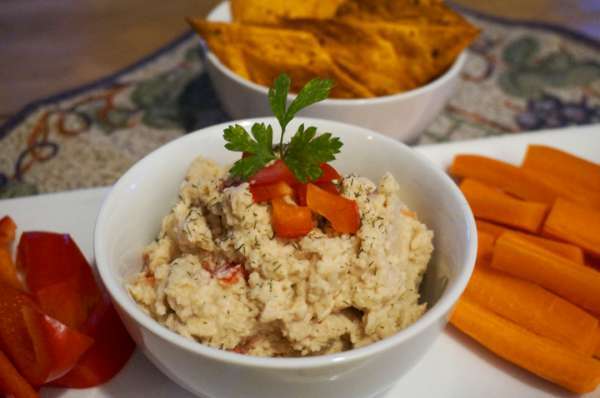 Thanks to Laura Theodore, the Jazzy Vegetarian, for this versatile vegan dip! Laura is the author of the fabulous cookbooks Jazzy Vegetarian Classics and Jazzy Vegetarian! 1. Put the white beans, cashews, water, lemon juice, garlic, salt and cayenne pepper in a blender or food processor and process until smooth and creamy. Add more water if thinner consistency is desired. Do not over process. 2. Transfer to a pretty bowl and fold in the diced pepper. Top with more diced pepper for garnish. Serve with carrot sticks, sweet pepper sticks, or tortilla chips! Let us know what you think of this easy vegan recipe: “Cheezy” Cashew Dip!